We only had one day to spend in Girona. That, and the fact that we had three rather grumpy teenagers trailing after us, meant that we had to choose what we saw very carefully. On any trip in the Catalonia region of Spain, you’re bound to see a lot of churches. Too many, if you’re traveling with teenagers, who just don’t see the charm of churches. I’m not even Christian, but I love the history inherent in churches. So much of each culture, whether it’s in Spain or anywhere else, gets poured into churches: their architecture and interiors, but also the events that happen in and around them. 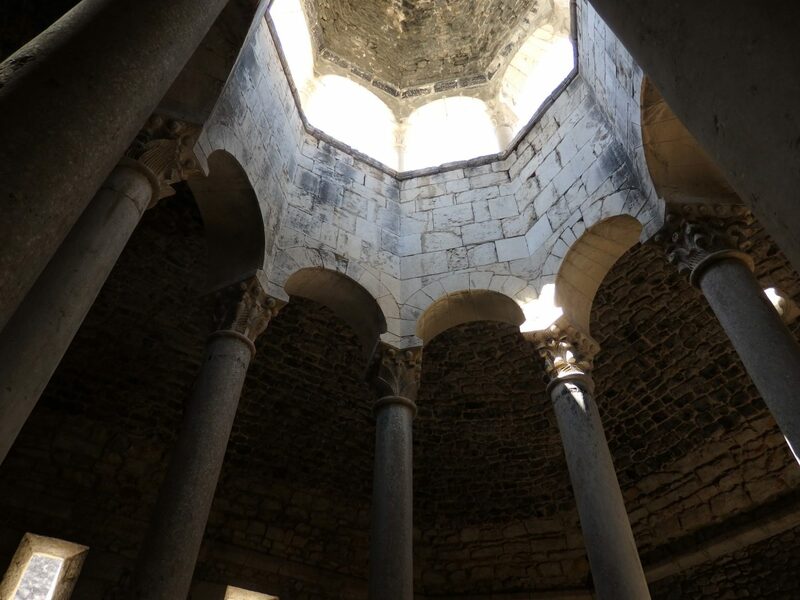 The Arab Baths of Girona have nothing to do with Arabs. Built – or, rather, reconstructed – in the Middle Ages under orders of King James II, it was just a bathhouse. People called it the Arab Baths because it imitated a North African style of bathhouse. That’s the only link. The bathhouse was used by Christians and Jews. No Muslims at all. Later, it was incorporated into a Capuchin convent. 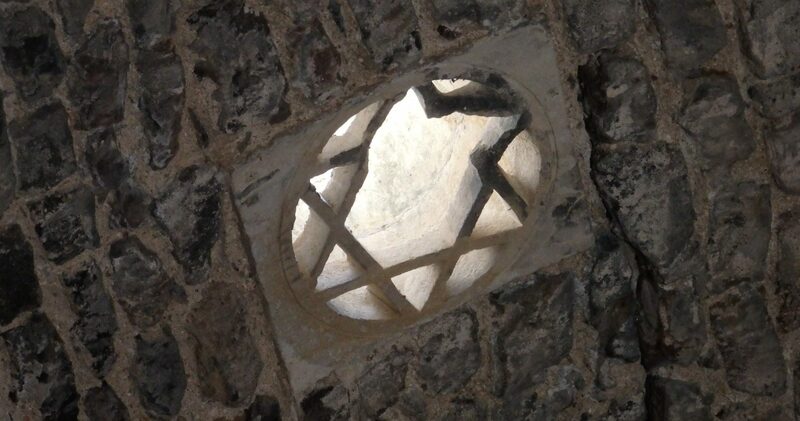 The light in the Arab baths filters in through small high windows, including this star of David. Nevertheless, the architecture is interesting, with columns carved with Christian symbols and lovely light that filters through from above. In its day, bathers passed through four rooms, one at a time – the apodyterium (the “locker room” with the dome, pictured above), the frigidarium (cold room), the tepidarium (warm room) and the caldarium (hot room). The heat came from an under-floor system, parts of which have been excavated for viewing. The cathedral of Girona makes a grand entrance. Generally, you first see it from below, and approach it up a wide stairway. It’s a huge cathedral, but its placement at the top of that stairway makes it appear even bigger. Inside, the gothic-style nave is purportedly the widest in the world. 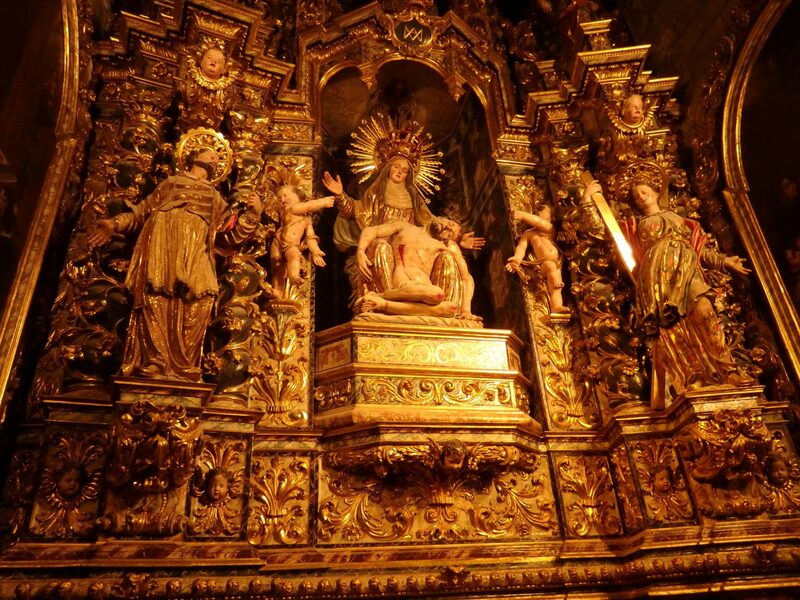 The chapels lining the sides of the cathedral provide a lesson in devotional art through the ages. Each alcove contains early medieval artwork or late medieval artwork or baroque or whatever. After viewing several of these, my foster daughter could identify the artistic period in the subsequent alcoves. An audio guide (free with admission) allows visitors to hear the stories that go with each of the chapels. 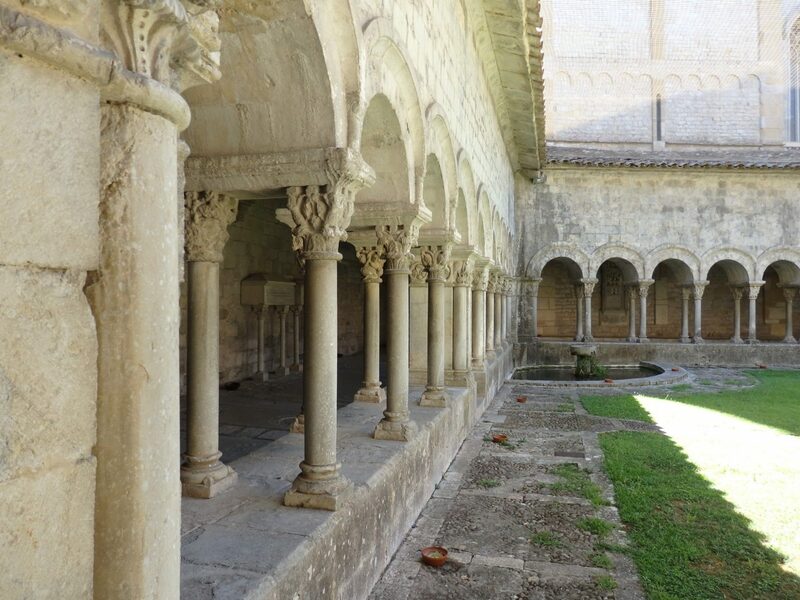 The cloister, like so many medieval cloisters, offers a moment of peace. Its remarkably well-preserved and detailed columns, especially the various designs on the capitals on top, are worth some closer study. The entrance fee includes the Cathedral Treasury Museum: definitely worth a walk-through. 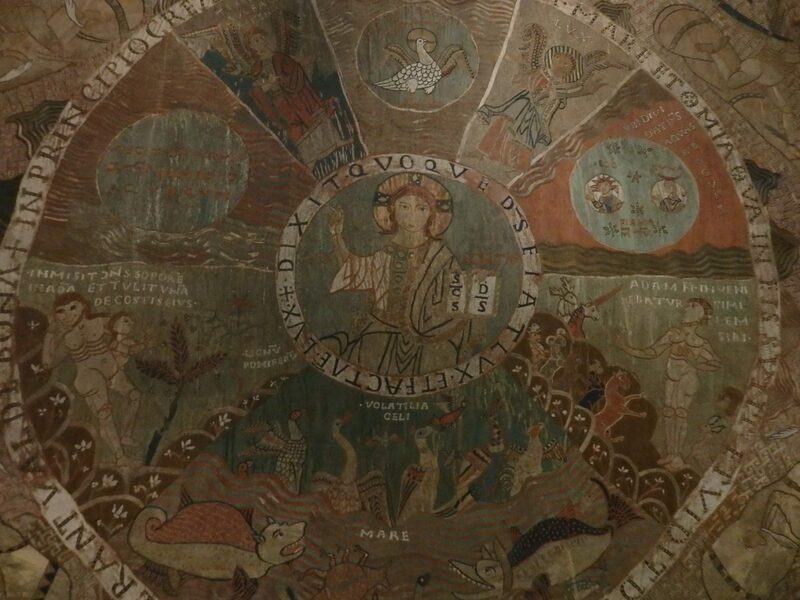 The highlight is the vivid and colorful 11th-12th-century Creation tapestry, with its images of the biblical creation story. While our foster daughter joined us in the church and enjoyed hearing the audio guide explanations, the two boys waited outside the cathedral, preferring to people-watch. That saved us paying the entrance fees for them, so it was fine with us. I think they would have enjoyed this cathedral about as much as they enjoyed the Dali Theatre-Museum on the same trip: not at all! Small apartment buildings painted in earth tones line Girona’s river: a pretty sight, which we viewed from one of several bridges across the river. This area of narrow streets beside the river was the medieval Jewish quarter. Originally based up the hill next to the Cathedral, the Jewish community moved down to this neighborhood in the 12th century. Their numbers dwindled until the Inquisition, when the few remaining Jewish families either fled or converted to Christianity. Many of the converts were put on trial for continuing to practice Jewish rites. Some ended up fleeing to avoid trial or were found guilty and either rehabilitated or executed. 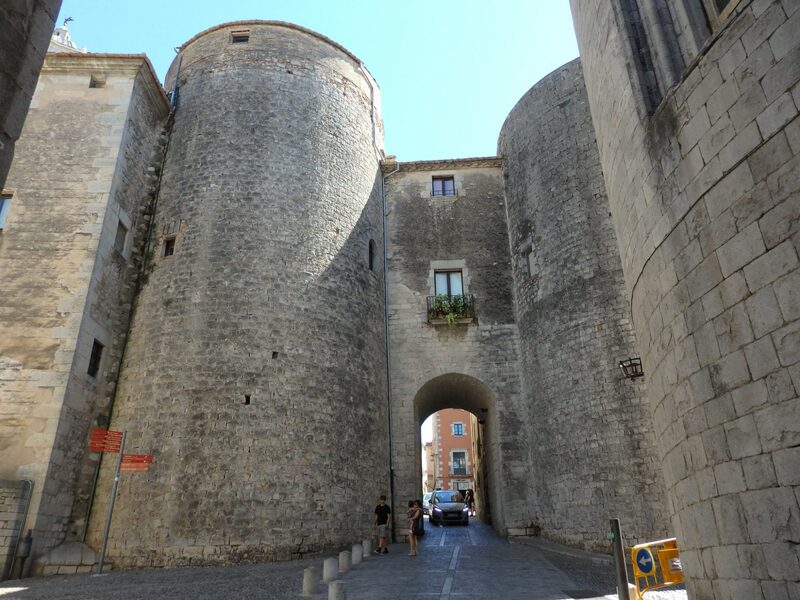 Further up the hill is the Força Vella area and medieval quarter, though it was not clear to me where the boundaries of each was. 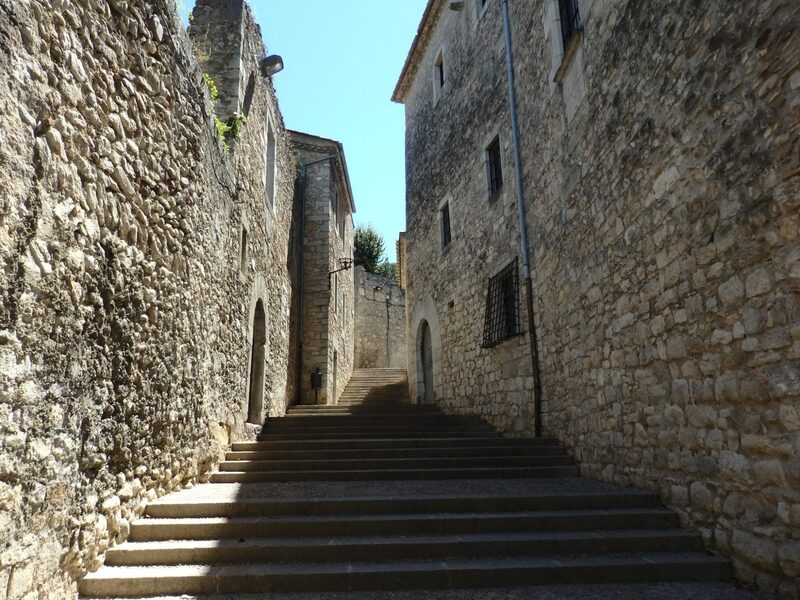 It doesn’t matter: the narrow, stone-built streets are shady and relatively cool, and you’ll pass through them anyway on the way to or from the Cathedral. A great way to get a look at the old city and the modern city and mountains beyond is from the restored remains of the 9th century city wall. You can walk on it for quite a distance, or just a segment or two. Here and there you can get an extra high view by climbing up in one of the guard towers. Parts of the wall have steep stairways, and in the heat of August it was a lot of work. Our teenagers didn’t bother with all the towers, but nevertheless seemed to enjoy the walk. The cathedral, by the way, doesn’t look nearly as big when seen from above and behind. Given the heat of the day and the presence of reluctant teenagers, that’s all we got to see. 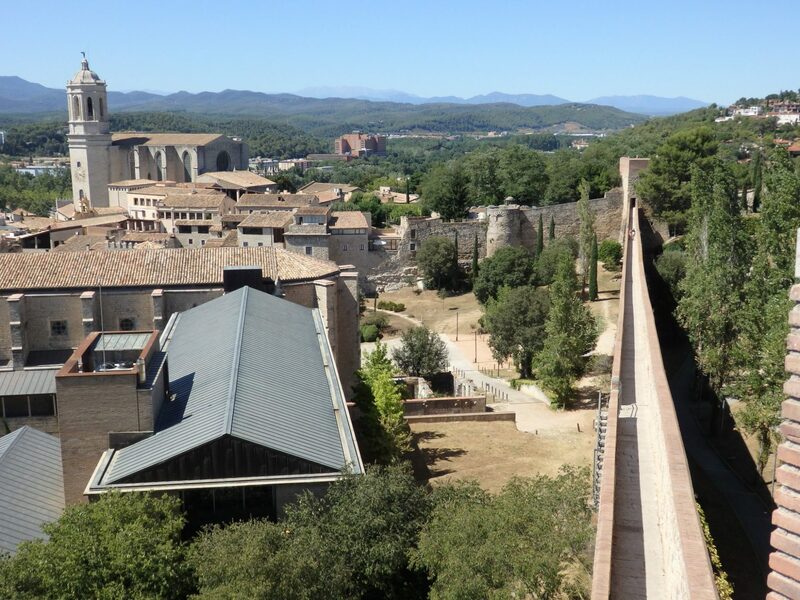 You can check out Girona’s tourism site to read about what else Girona has to offer. Some of the museums sound excellent. 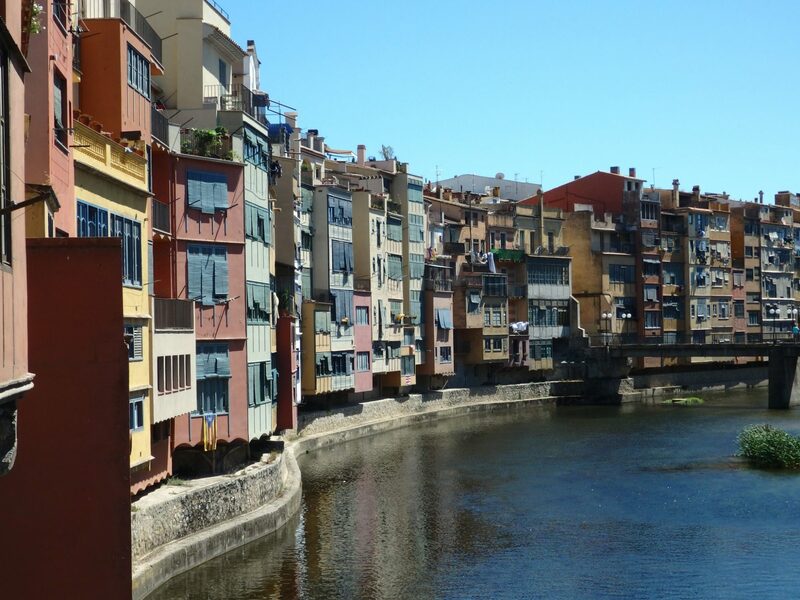 Have you been to Girona? 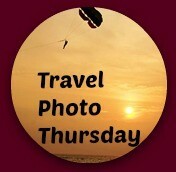 Add a comment below with your suggestions of what to see there! Nothing! Stay in our Airbnb apartment and play video games or watch videos or, in the girl’s case, talk for hours with her friends via whatspp. Sounds like teenage angst – That dreadful time when doing nothing is infinitely more appealing than hanging out with your parents. It must be the same no matter what country you live in. 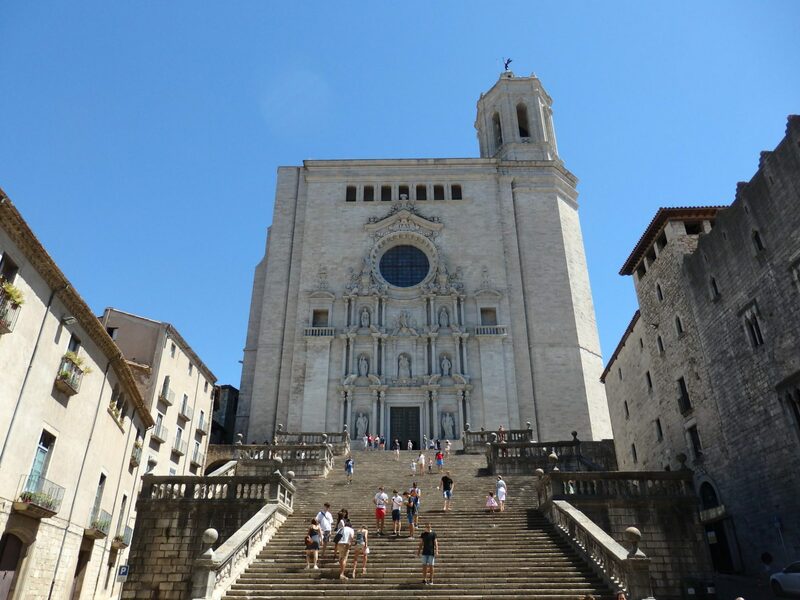 However, Girona looks like a lovely city to visit and while we’re not religious, I really do enjoy visiting the old cathedrals and small churches. I love walking into the immense spaces where the atmosphere is hushed and treasures glow in the filtered light. Maybe someday I’ll get “churched out” but not for awhile! You’ve phrased beautifully what I like about historical churches! The kids I was traveling with are my son (Dutch and American) and two Syrian kids. So, yes, I think it might be universal.